My friend has an oil burner installation business and brought up a problem he has. The burners have an oil filter that has to be changed regularly and these used filters are considered hazardous waste as such, so getting them processed correctly costs very much. But if the oil filter is crushed so that the remaining oil inside the filter gets out, this crushed filter can then be thrown in to a metal recycling bin. The oil from the filters is collected and either used in a waste oil burner or given to a hazardous waste plant as fuel for their burning processes. At first I of course used Google to search for existing solutions to see how the crushing is done commercially. The search results indicated that most of the commercial crushers are using pressurised air and some work with hydraulic/electric power. The usual tonnage I saw was between 3 to 10 tons, most of the crushers being in the 6 to 10 tons category. I first thought of using pressurised air as that is easily available at 10 bar pressure, but to get 10 tons of pressure needs a piston that is about 350 mm in diameter. The idea of turning the piston and cylinder myself in a lathe felt like a bad idea and I didn't even want to know how much a commercially made cylinder would have cost, so something else had to be considered. I had thought of using hydraulics and investigated on the price to build a hydraulic pump unit and a some sort of press frame from steel, but the price would have been in the 500 EUR and up category just for the hydraulic parts. I talked about this idea at work and one guy suggested using a hydraulic log splitter. Hydraulic log splitter. That idea had potential, as I knew those would cost very little and so I did a quick search. A local business called Motonet had on their website four different models, three ranging from 199 to 299 EUR for horizontal models and one vertical model for 399 EUR. Each had a 6 ton rated capacity, so they all had enough force. And for this price it would have been impossible to get this crusher parts let alone all the work neeeded. My friend wanted the vertical model as it had small foot print and seemed very sturdy. 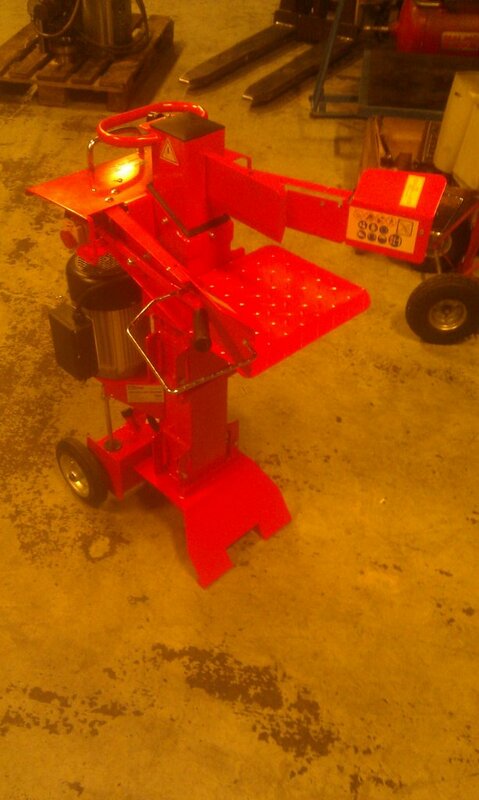 The log splitter originally has a table that is stationary and the splitting wedge moves up and down by hydraulics. It has a 3 kW electric motor so it needs a 16 A wall outlet to run. 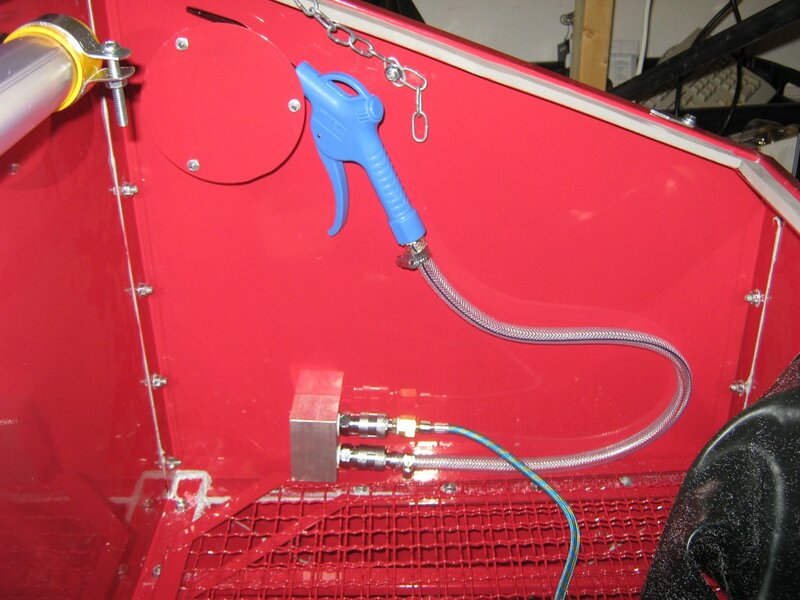 In operation the motor runs constantly and circulates the hydraulic oil through the operating valve back to the tank. When you push down both hand levers the valve opens and the piston pulls the wedge down. When either the travel ends or the pressure is at its maximum, an overpressure relief valve opens and lets the oil flow past the cylinder. When the levers are let go, the valve moves to the other end by a spring load and the piston moves up until a small limit rod pulls the valve to its center position and the movement stops. I measured that when the wedge is at its lowest position, there is a gap of 135 mm from the wedge to the table top. I also measured that the wedge is not parallel to the table but inclined about 5 mm from end to end. This meant that I had to use an angle grinder to get that inclination away and to make such an attachment that it has at least 135 mm height. The inclination was easy to get rid off, I just put a straight edge against the square tube and drew a line on the side of the wedge. 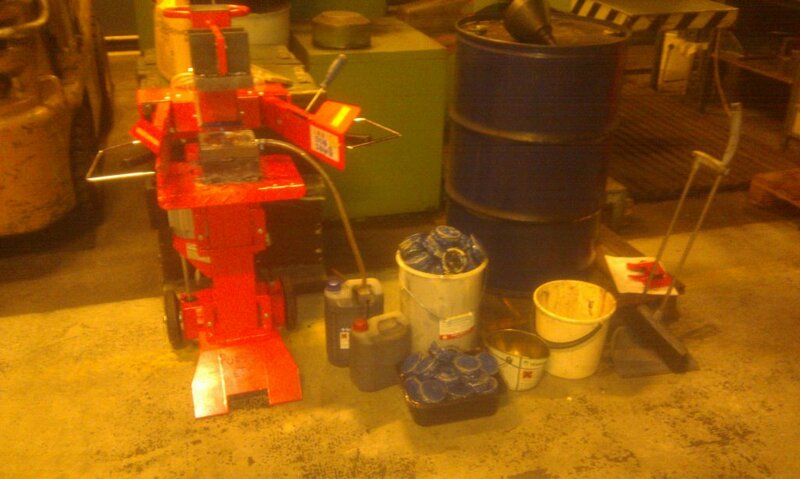 As the oil filters are about 75 mm in diameter I had to have at least about 100 mm square plates for crushing the filters. I found about 140 mm square plates from the scrap bin that were both about 25 - 30 mm thick, so I sawed off a section of U-beam to lift up the other plate enough from the table. I squared everything in a CNC mill and used it to make a 120 mm in diameter and 3 mm deep pocket on the lower plate. I also made the pocket to be a little bit concave on the bottom, so the center is at 6 mm deep to get the oil to flow to the center. In the center I drilled an almost through hole and from the side of the plate I drilled an 11.7 mm hole to the center and tapped this with G 1/4" pipe thread. After removing paint from the parts, I used a MIG welder to put everything together. The welds were a not so good in some places as the welders copper tip was worn out, no new one was around and thus it gave me problems every 10 seconds or so. 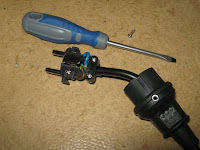 Finally after cooling the parts I was able to assemble the not-so-log-splitter-anymore and to test it out. I screwed in a hose fitting on the side of the lower plate and ran a short length of hose to a collection bucket for the oil. The first test was to run down the piston to its lowest position to see how smmall gap there is between the crushing plates and this showed to be about 10-15 mm, so it might hurt your fingers a little if left between. The second test was of course to put a used oil filter on the bottom plate and see if the machine has enough power to crush it. With safety glasses on I pulled the levers down and watched as the filter nicely folded down in to a pancake. In the almost end of the stroke I saw an ooze of oil squirt down the hose in to the bucket, so it worked just like it should. The end result was a very flat oil filter, about 25 % of its original size and about a 100 ml of oil. The total time to crush a filter was about 10 seconds. Of course I called my friend to let him know that the machine was ready and that he would bring a box of used filters with him to test the machine. He showed up with about 50 oil filters in three carton boxes and together we crushed them in no time. End result was only a small bucket full of crushed filters and 5 litres of oil. No wonder they charge so much to dispose off as hazardous waste. 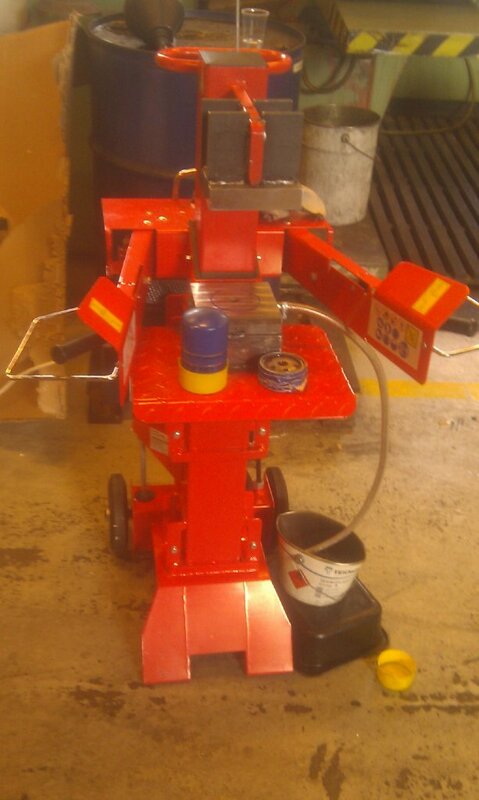 Now he saves lots of money by recycling the empty oil filters as metal and by giving away the used oil as a fuel. And even if the regulations would say that the crushed oil filters are still hazardous waste, it would cost less to dispose off as they weigh a lot less and take up smaller space. Now the only thing to do is an oil change to the crusher and adding an oil filter to the pipe that runs from the tank to the pump to keep the machine in operation for a lot longer than the original. 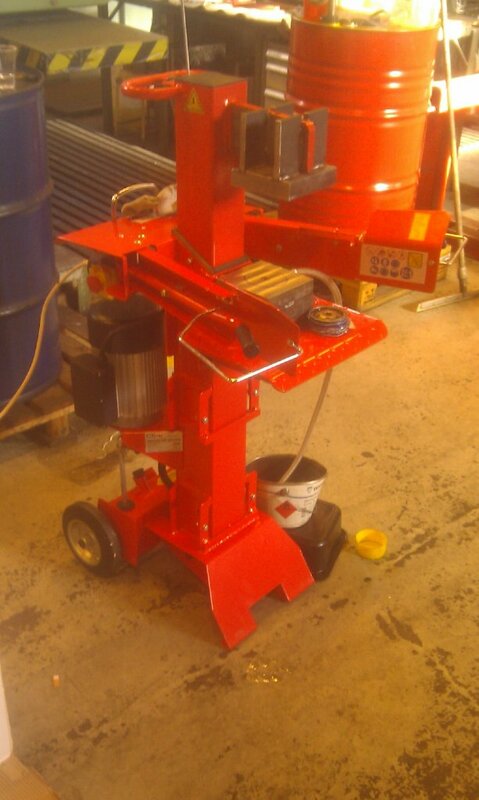 And as hydraulic log splitters can be had with a 1000 mm stroke and 6 tons of force and they contain everything needed between an electrical wall outlet and the hydraulic piston and the fact that they cost only 200-400 EUR, this will be my source for hydraulic power unit for a small hydraulic press. Nice to have electric motor running and just pressing a button to get all the movement without tedious hand cranking. 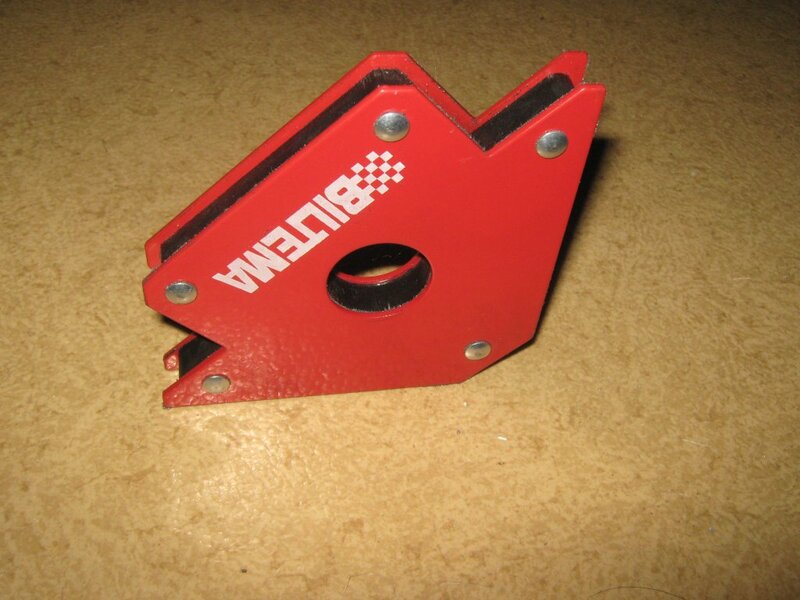 Coming up soon is an article of an oil filtercrusher, stay tuned! I was looking for information and dealers for the SIEG CNC series and came across a very low price dealer in Europe called SIEG Scandinavia. 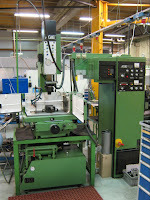 They offer on their website the whole SIEG production machines and at a very low price compared to for example Finnish dealers. On some machines there is free shipping in European Union, but generally the DHL cost is 120 EUR per machine, which is very reasonable. I haven't yet bought anything from them, as I'm collecting money for the SIEG KX3-CNC machine with a Mach3 software. 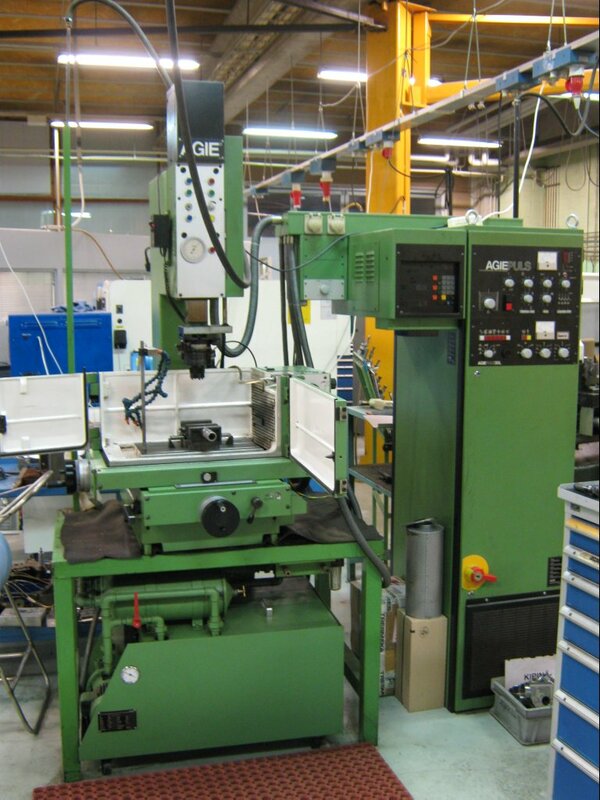 The SIEG C4 lathe that I bought from Axminster Tool Centre works on 230 VAC 50 Hz mains voltage, the same we have here in Finland. 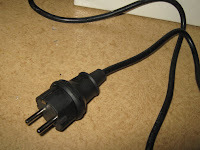 The only problem was that the power plug in the end of the cord was some British type and not the kind of we use. So I went to the local hardware store and bought a plug that is made of rubber, rated for 16A and has an insulation class IP44. The cost of the plug was 1.79 EUR, so it is cheap. I don't know of other countries laws on electrical work, but here everybody has the right to change a power cord to a device. Technically I'm not changing the cord but in reality I'm doing the very same end result with the same connections so it doesn't count. 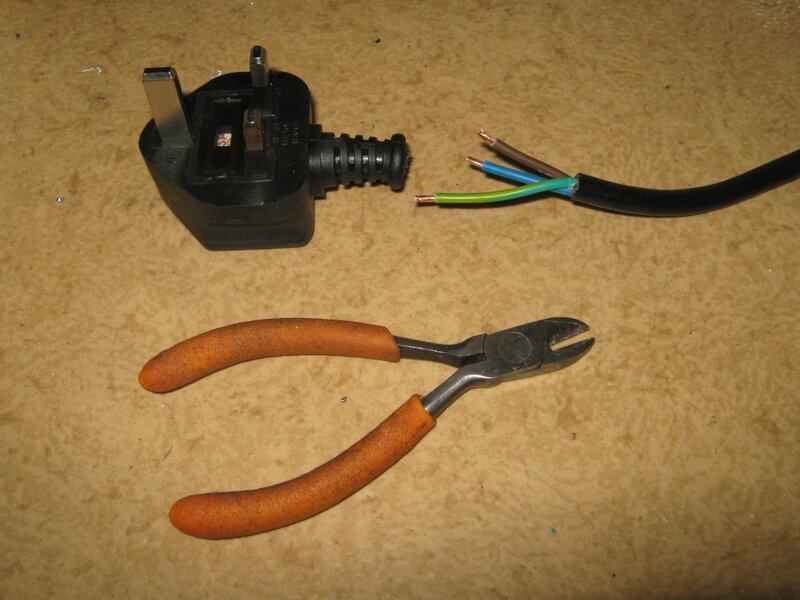 First thing to do was to cut the original British plug and toss it. At the same time I stripped the insulation down about 40 mm and clipped the neutral and live wire about 5-10 mm shorter than the grounding wire. This is made so that if you yank the cord and the wires get ripped off, the ground connection is the last one to rip off and in some cases it can save your life. In this plug it doesn't matter that much, but I have a habit of doing this always so I don't forget it. I stripped the insulation off of the ends of the leads for about 5 mm and twisted the stranded wire together. Using a screwdriver I opened the new plug and screwed off the strain relief. 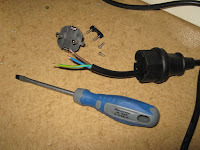 First I opened the screw for the grounding wire (green-yellow) and put it under the screw and tightened. After that I bent the live (brown) and neutral (blue) to their attachment points and screwed them tightly. This plug type is non-polarised, so it doesn't matter which way you attach the live and neutral. Last I screwed the strain relief tightly so it clamps on the black insulation of the cord. Pulled the cover on and screwed it snug and this modification is done. Some have asked what I do for living or what is my profession. At the very moment I'm still in college, but I'm getting my degree in tool & die making in 3 months. Tool & die maker is basically like a machinist, but it is more to do with jigs, fixtures, molds, dies and tools. And generally speaking tool & die work is not a job where you make a hundred of this and a million of that, but rather one of this and two of that. I already concluded all my obligatory training and exams, so I'm basically waiting for the graduation event and using this time to be at a moldshop to earn some living money. In this same place (Työkalutyöt Mattila Oy) where I work I did my thesis work, which was a very basic permanent casting mold for aluminum. 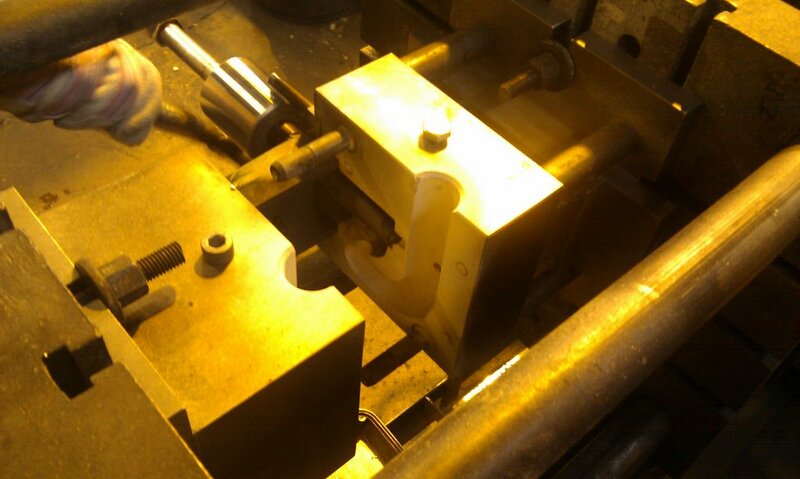 The photo on the right shows the mold installed in the casting machine. This PDF (17 MB) descripes the work with lots of pictures, but unfortunately it is only in Finnish at the moment. I'm planning on writing it in English once I learn what the different mold parts are called in English as I don't know them all. I have had extensive training in school about plastic injection molds, but at the company I work we mainly do die casting molds. They work essentially the same but have much more work and things to consider as the mold fills up with liquid aluminum rather than liquid plastic. I'm more specialised in assembling the mold, which means finishing all the pieces, fitting them together, assembling everything and making the small pieces that are missing with (usually) a manual lathe and a surface grinder. I also do mold polishing and fitting the whole mold after assembling it. And when the need arises, I use the CNC mills with MasterCAM or straight from the Heidenhain controller panel to make parts. I mainly use 3-axis mills, but I have had some limited training on 3+2 axis work on a 5-axis machine. 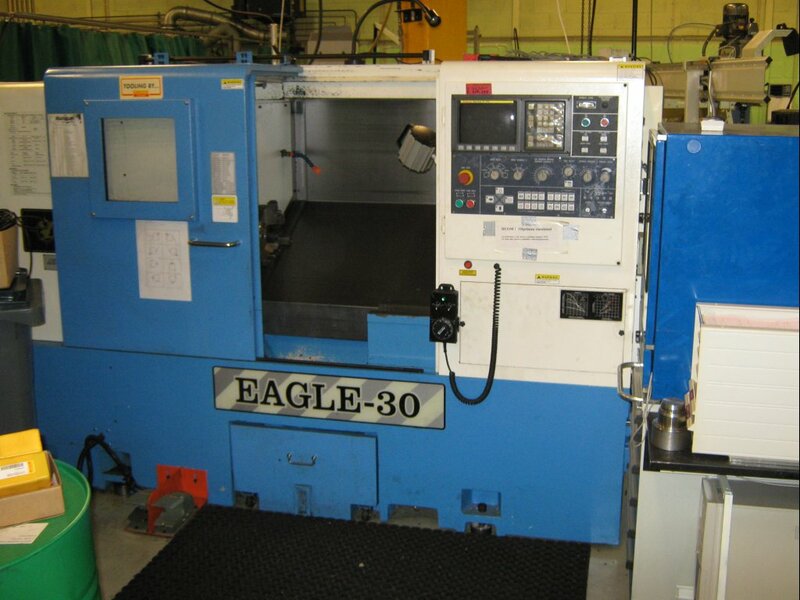 We don't have a wire EDM, but I do know how to operate one as I have used Fanuc 0iA and 1iC machines. Sinker EDM experience is a little bit less than my wire EDM experience, I have only used an AGIE-Charmilles and repaired an old AGIE (older than me!). The one pictured on the right is the machine we had in school. We also do not have a CNC lathe, but I have used one small machine at school (picture on the right) extensively, as I was the only one who knew how to operate it. Nobody had a clue of how to run it, so I did as I always do: RTFM. In the course of learning to use the machine I wrote a manual for the lathe in Finnish with lots of pictures. The lathe controller was Fanuc 0-TD, meaning very old and very basic. 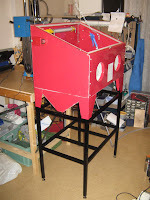 I also made a stand for the blasting cabinet to get a comfortable working position. This is the reason for the elbow connector in the air line, so that it doesn't take room but goes down, as my workspace is very limited and getting pretty crowded with all the various stuff. 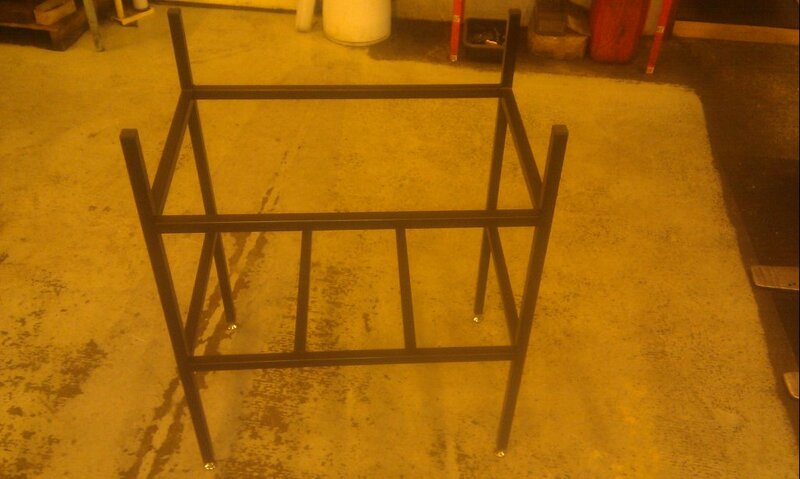 I welded the stand from 25 x 25 x 2 square steel tube, better known as "furniture tube" in here. I used a MIG welder because that was available and it is quick to use. I got the material from Rautasoini and it cost me about 20 EUR for the 9.6 meters of material and a cutting fee of 1.7 EUR, so quite cheap. For welding the frame nice and square I bought a magnetic square from Biltema for 5.49 €. It provides 30 kg of magnetic pull and the 105 mm side length provides accuracy. I tested this little gadgets accuracy with a 400 mm machinist square and the magnetic square was truly a square. In retrospect I should have bought two or three of these to make the setups even more easy, but even with only one I could free my hands and got rid off of using clamps and got everything square in one go. Once I had welded the frame I checked the diagonal lengths and found that there was 1 mm difference in 900 mm distance, so it was really good. The frame was a little bit twisted, as it rocked on the floor a little, but I fixed this by grinding about 0.5-1 mm off from one of the legs. This way the blasting cabinet sits on the stand without rocking during use. The floor side of the frame doesn't matter as the stand will have adjustable feet. I used an air powered angle grinder to smooth the welds in all corners and then an angle sander on all surfaces to break the shiny metal so the paint sticks better. I wiped all the grinding dust with a rag and then used a clean rag and solvent to go through all surfaces to remove the last bits of dust and all the oil. I had bought red oxide primer and black matte spray cans from Biltema for a total cost of about 10 EUR. I sprayed the primer on the frame in thin layers and with a help of a flashlight I inspected every surface that there were no metal to see and that the primer was smooth. I let the primer dry for half an hour and wiped the surfaces with a clean rag to remove the primer dust. I applied the black paint also in thin layers to get an even result, but run out of paint once I had the first layer, so I went and bought a second can of paint. This got me approximately two layers of paint and even surface, so good enough for me. I let the paint dry for two hours. To give the stand good stability and finish I bought four plastic caps that were intended for this type of tube and had M10 nuts molded in them, so I could screw in the adjustable legs. The upper ends of the tubes I sealed off with similar end caps. All the caps I just whacked in with a rubber mallet and they fit snugly. Once I got the stand home, I moved it to the correct place, adjusted the feet for level and stability and lifted the blasting cabinet on top of the stand. Fit as it should, with about 2 mm of free space from the tubes to the corners of the blasting cabinet. Last bit to get this stand finished is to buy a piece of film faced plywood, cut the corners and install it on the supports I welded halfway up the stand to act as a storage space. Here is my blasting cabinet in operational condition albeit still on the floor in this picture. 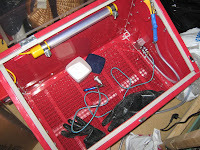 The small rectangular box contains about a litre of pantyhose filtered glass beads ready for use in the small blasting pen. The blasting pen is the one with the long and colorful hose in the middle and it has a small cup that holds the blasting media. 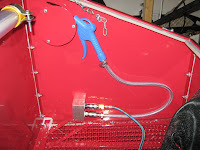 The original blasting gun was supposed to be installed with a small female connector in the right hand side panel so that there would be a G 1/4" female thread for a pipe connector. But as I'm not going to use the original gun but the blasting pen and I want a small air gun in there also for cleaning, I made a small splitter block from aluminum. The splitter block has two female quick connectors to attach the pen and the gun. The splitter has G 1/4" threads for the quick connectors and one cross drilling that I plugged from the end with an R 1/4" plug and pipe connection glue. The air gun is from Biltema and provides very good adjustability as the trigger lever is long. It also happened to have the dangling hook in an otimal place just by coincidence, as I found out that it fits perfectly loose to the M4 screw that holds the air filter in the cabinet and is in reach of my hand while working. 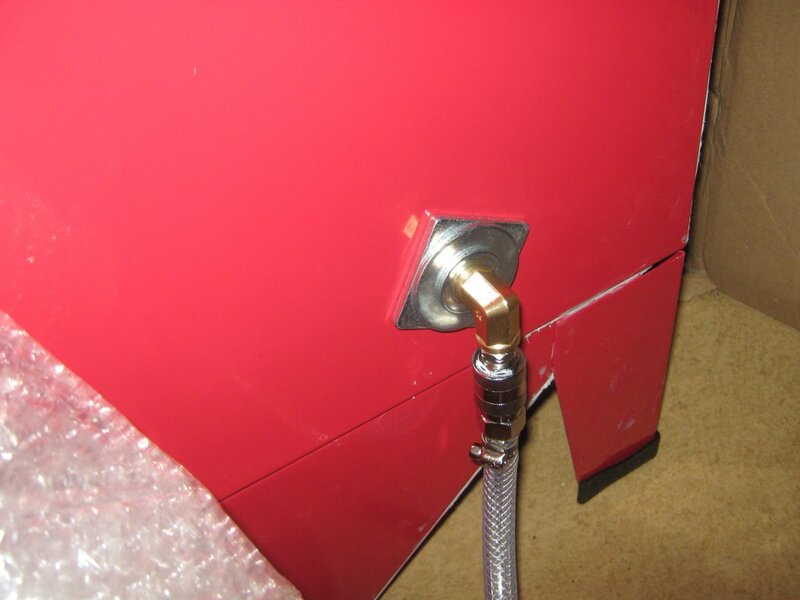 The hose for this air gun I liberated from the original blasting gun as it is quite thin walled and very flexible, so it is easy to maneuver inside the cabinet. 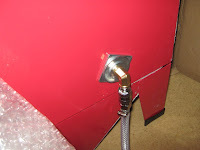 The inlet to the splitter block comes from the compressor with a hose that has a female quick connector in the end that fits a male quick connector. This is attached to an elbow joint that is going through the cabinet wall to the splitter block and keeping it also in place. The elbow connection saves me some lateral room as it comes out only about 30 mm from the side of the cabinet versus about 100 mm that it would take with the quick connector & hose coming in horizontally.